In the beginning only the Immortals had Fire. Prometheus looked with compassion on the cheerless creatures of earth. In defiance of the gods he stole Fire from the heavens and brought it to earth. Yesterday was the first day of summer in the Northern Hemisphere. Although, it has felt as if summer has been with us for several weeks. Across the country temperatures have soared, creating new weather records. Living in the southwest we are no strangers to summer heat and drought. 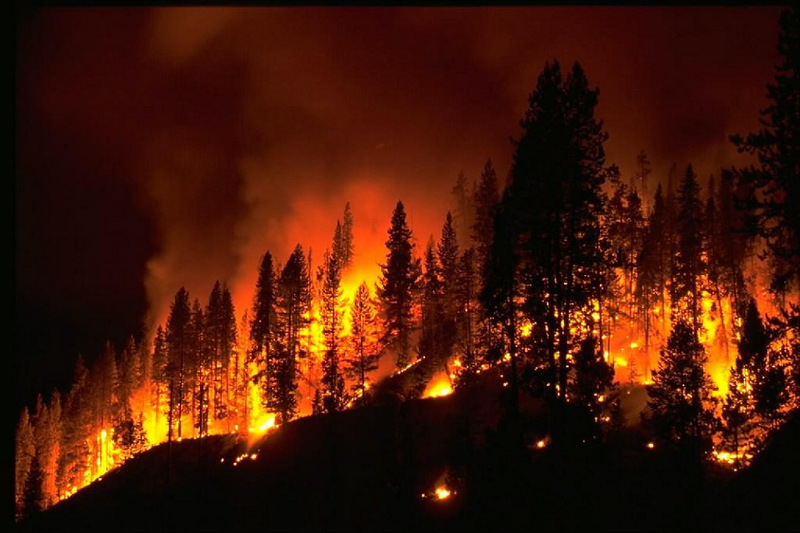 The combination all too often results in disastrous wildfires. Throughout history firefighters have been the heroes who braved the flames of Prometheus to protect the towns and homes of the citizenry. Because of the dangerous conditions they faced, firefighters were given special protective clothing which differentiated them from the populace. One of the most familiar apparel was worn from the earliest times by Japanese Firemen. Their jackets (Hanten) were made of various materials. In the Edo period some were made from deerskin. In the 19th C they were constructed from quilted wool or cotton, sometimes with silk linings. The unique feature of these jackets, from an artistic point of view, was the elaborate decorations (many were considered lucky or protective symbols) which were woven, painted or embroidered on the surface of the garment, as well as on chest protectors (Maekeke). There are many examples of these vintage fire jackets to be seen on the internet. One component of many protective garments has been used for centuries. It is the mineral asbestos. Asbestos is found throughout the world and its fibers were used as reinforcement in early pottery. Once the fire resistant properties of asbestos were known the fibers were woven into cloth. The unfortunate aspect to the use of this mineral in a wide variety of applications, is the fact that asbestos fibers are carcinogenic and could cause Mesotheliosis. Over 50 countries have banned the use of asbestos fibers, the US is not one of them. Modern firefighters wear garments called “turnouts”, protective clothing. These garments have 3 layers: an outer shell, a moisture barrier and a thermal barrier with pockets of air (dead zone) in between the layers. Footwear is boots with a steel toe insert or rubber boots. There are additional items such as gloves, helmets and hoods. Depending upon the type of fire, they may also wear hazmat suits. For fighting wild fires their clothing is modified. Their garments are a single layer, they wear industrial hard hats and leather logging boots. They cannot wear steel-toed boots nor rubber boots due to the heat conditions of the fire. These garments are made of a combination of two fibers of the nylon family : Nomex and Kevlar. Both of these synthetics are product of the DuPont Corporation and are variants of aramid. Kevlar is an aramid that does not melt, is highly flame resistant, is exceptionally strong (5 times stronger than steel on a weight basis). It has a high resistance to stretch and maintains its shape and form at high temperatures. It was first synthesized in 1971. Nomex is a variant of aramid but unlike Kevlar, Nomex cannot align during filament formation and therefore has poor strength. However it also has excellent thermal, chemical and radiation resistance. Nonex was developed in the early 1960’s and first marketed in 1967. May the Immortals protect them all.